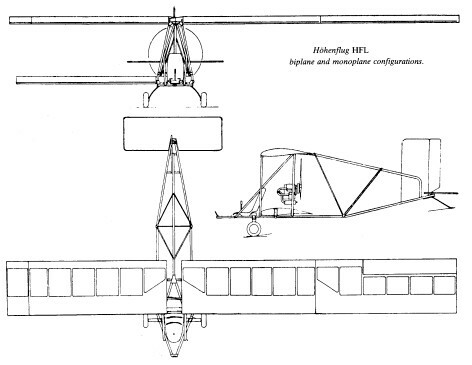 Single-seat single-engined high-wing monoplane or biplane with conventional three-axis control. Wing has unswept leading and trailing edges, and constant chord; conventional tail. Pitch control by fully flying tail; yaw control by fin-mounted rudder; roll control by ailerons; control inputs through stick for pitch/roll and pedals for yaw. Cantilever wing; wing profile Worthmann FX63-137; double-surface. Undercarriage has two wheels side-by-side with tailskid; suspension on both wheels. No ground steering. No brakes. Aluminium-tube framework, without pod. Engine driving pusher propeller. Wings made from carbon-fibre and unidirectional glassfibre. This single-seater is unusual in that it can be used either as a monoplane or a biplane. Its wing is in effect made up of four half wings, of which two form a high wing attached to the top of the tubular framework. The remaining two wings can either be joined to those of the top wing in a monoplane configuration or fitted to the bottom of the framework to make a biplane. These two 'wandering' wings are fitted with ailerons. As the four wing elements are of equal span, chord and area and the framework is wider at the bottom than the top, the biplane thus produced has a lower wing of greater span than the top. To avoid such aerodynamic nonsense, Hohenflug adds two wing-tip sections to the upper wing to give it a slightly greater span than the bottom. In either configuration the wings are of cantilever construction with neither rigging wires nor interplane struts. This Hohenflug bird was announced as due to make its first flights during summer 1983 and no information on its marketing strategy has so far been received. It is also not yet known which motor will be used, but the calculations have been based on a power range of 20-28 hp. The engine is fitted behind the pilot above the lower wing and drives a three-blade pusher propeller. Length overall 16.4 ft, 5.00 m.
Wing span 38.7 ft, 11.80m. Chord at root 3.6 ft, 1.10m. Total wing area 140sq.ft, 13sq.m. Wheel track 3.9 ft, 1.20 m.
Propeller diameter 45 inch, 1.13 m (three-blade). Empty weight 199 lb, 90kg. Max take-off weight 442 lb, 200kg. Payload 243 lb, 110 kg. Max wing loading 3.15 lb/sq.ft, 15.4 kg/sq.m. Max power loading 15.8 lb/hp, 7.1 kg/hp. Load factors; +4.9, -2.5 ultimate. Max cruising speed 50 mph, 80kph. Range at average cruising speed 124 mile, 200 km. Wing span 22.6 ft, 6.90m. Chord at root 3.6ft, 1.10m. Total wing area 151 sq.ft, 14 sq.m. Wing aspect ratio 6.311 top wing. Propeller diameter 45 inch, 1. 13 m (three-blade). Empty weight 203 lb, 92kg. Max take-off weight 442lb, 200kg. Payload 239 lb, 108 kg. Max wing loading 2.92 lb/sq.ft, 14.3 kg/sq.m.